Young, reproduction, varieties, care, examples of landscape design, photo and video. 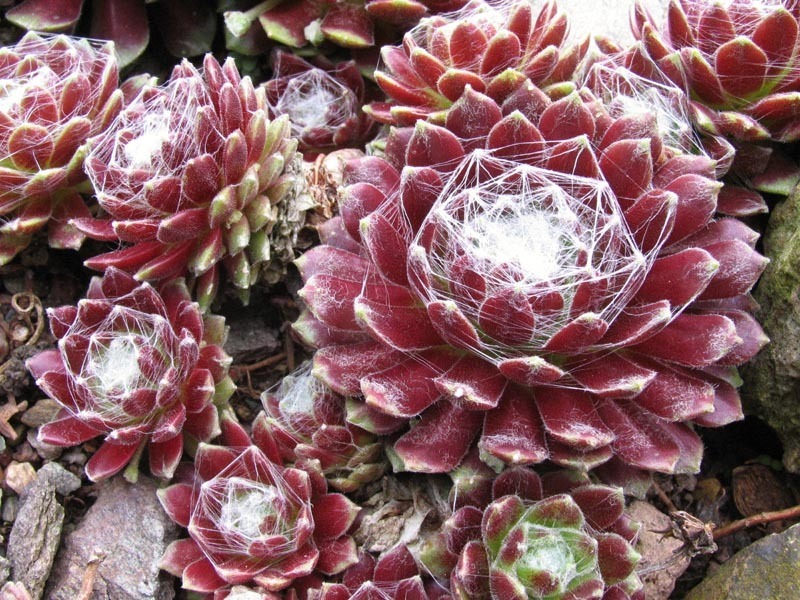 Beautiful, unusual succulent – almost the champion in the number of names. Translated from Latin – "live forever" plant, English – hen and chickens, Russian folk etymology – cabbage rabbit, stone rose, young, Ajuga. An old legend says, in Europe the plant was dedicated to the Torah – the Scandinavian God of thunder and lightning. By order of Karl the Great rosettes of succulent planted on the roofs of houses, considered, this security measure will protect the building from natural disasters instead of lightning rod. With multilam is linked to many Russian superstitions: plants, taken together with wine, served as the antidote, in times of Vladimir the Red Sun that was the actual measure of protection from the attacks of enemies. Special tincture did the hearing and vision of a man sharper. Beauty a thousand years ago, rubbing cheeks with the fresh juice of the plant, to blush was a bright, the young grooms before. The genus has 50 types of plants, native to Eastern, Middle and southern Europe, in Small and South-West Asia, in the Caucasus. 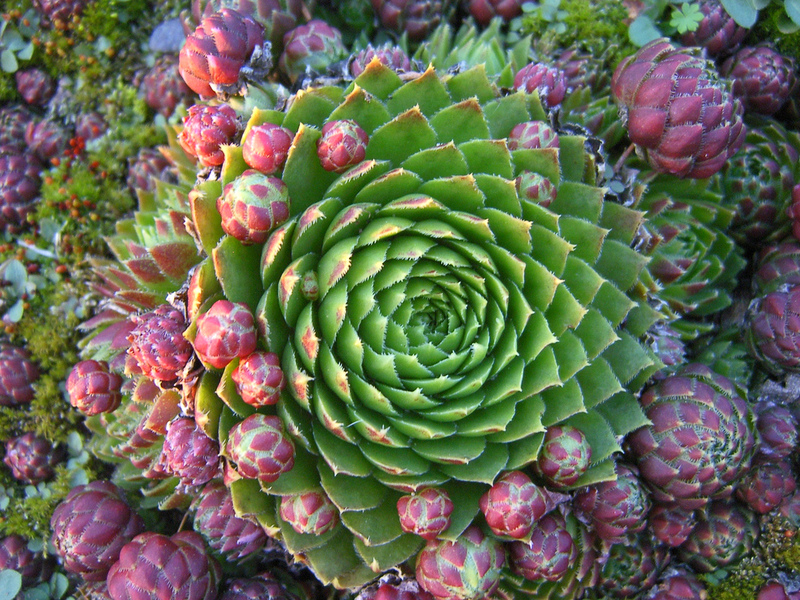 Houseleek grows on rocky soils or on the sandy, in the pine forests. Stone rose's hybrid easy in the wild and under artificial breeding. Dense petals can be of different shapes and colors, they can be pubescent, covered with glandular hairs or almost glabrous, diameter – 15 cm. Beautiful garden plant unpretentious, they can decorate flower beds and paths, create a rock garden. Young looks interesting in pots, combination of different varieties allow you to create a striking and unique composition. 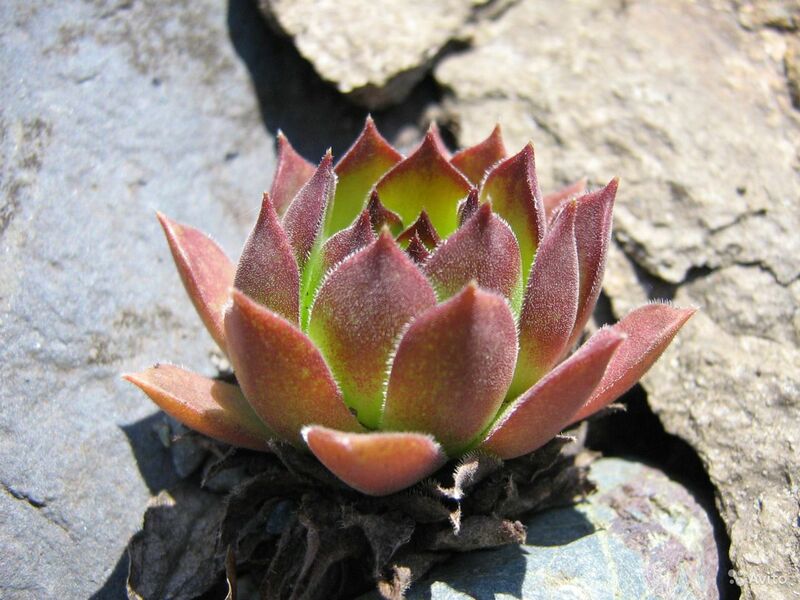 The succulent grows well in any soil, in addition to the swampy and sour. For loosening soil, sand is used, granite screenings, expanded clay. Excess nutrients can adversely affect the color of the plants. Stone rose planted so, to the distance between the "baby" was 10 – 15 cm, for smaller varieties enough 3 – 5 cm. A year later a new outlet can completely cover the surface of the soil. Care simple, it is to remove the weeds, while the plants are young, and the faded parts with the dead rosette of leaves. 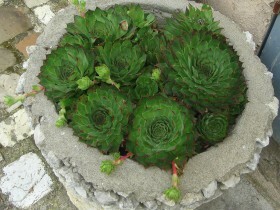 The young seedlings once in 3 – 5 years, when the succulent is getting crowded. Vegetative reproduction is preferable, child sockets are separated and transplanted in the spring and summer. Small plants are kept in beds, large – planted in a permanent place. If you select the seed method, the planting material should be sown in February or March, depth of seal – 1 mm. Seedlings should appear in 3 – 5 days, temperature of germination – 20 degrees. Seedlings kept in the light, but protect from scorching heat. Plants are planted in the ground in June-July. The name of the species comes from that time, when they are "wings" of the roof. Sockets can be spherical or slightly flattened, diameter 4 to 15 cm. The leaves are large with sharp, reddish tops. The flowers are dark- or light purple, similar to an asterisk, collected in inflorescence. The plant blooms in July and August for 45 days. 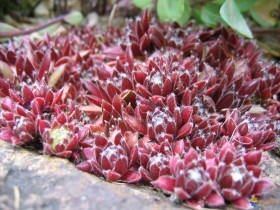 Roof houseleek grows in Asia Minor, in Western and Eastern Europe. The young roofing on the stony ground. Sockets in the form of balls, diameter – 5 cm. Leaves – light green, flowers – pale yellow or greenish, collected in inflorescence. Blooms in July and August, for 40 days, found in the wild throughout the European continent. Young proliferous, surrounded by young plants. 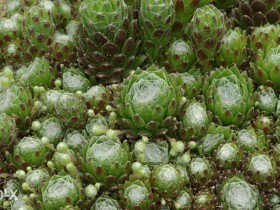 The plant can be found in the mountains of Western Europe. Leaf rosettes globose, slightly flattened. The leaves are bent at the ends, light green with a reddish tinge, which increases with the approach of autumn. Peduncles leafy, to 30 cm tall. The flowers are also reddish. Grows in the Balkans, in Russia and Asia Minor. Outlet – up to 6 cm, flowers – yellow, inflorescence up to 35 cm in height. Blooms in July and August, for 40 days. Homeland – The Caucasus, North-Eastern Turkey. Sockets – up to 5 cm, flowers yellow – green or yellow. Stone rose blooms in July and August. 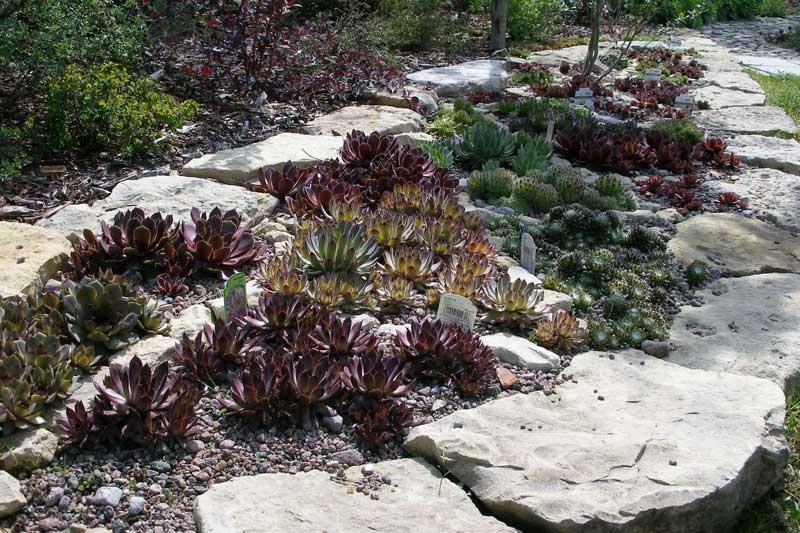 Succulent unearthly beauty used in garden design long, the creators of the stunning gardens and parks, the French, invented to combine different types of stone roses, planted along the tracks, enthusiastically engaged and carpeted landings. 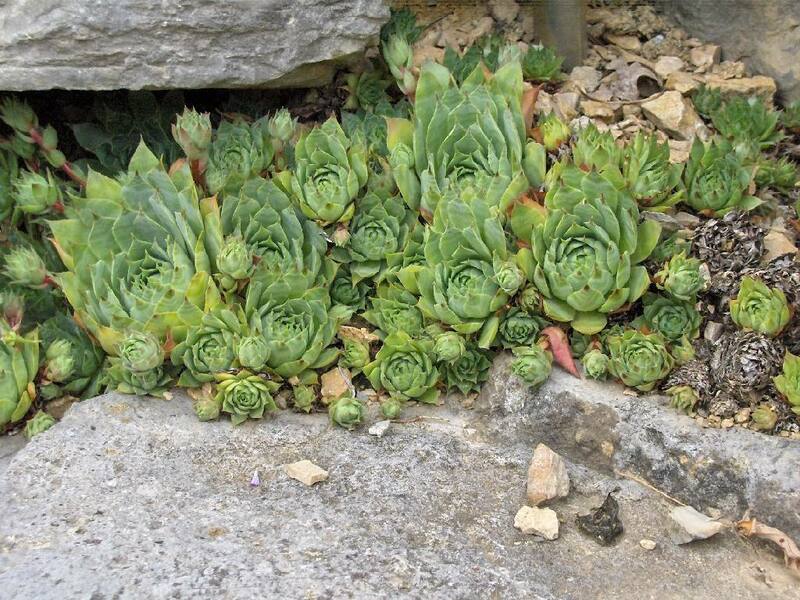 In the nineteenth century, houseleek has been used for the decoration of rock gardens and free spaces. 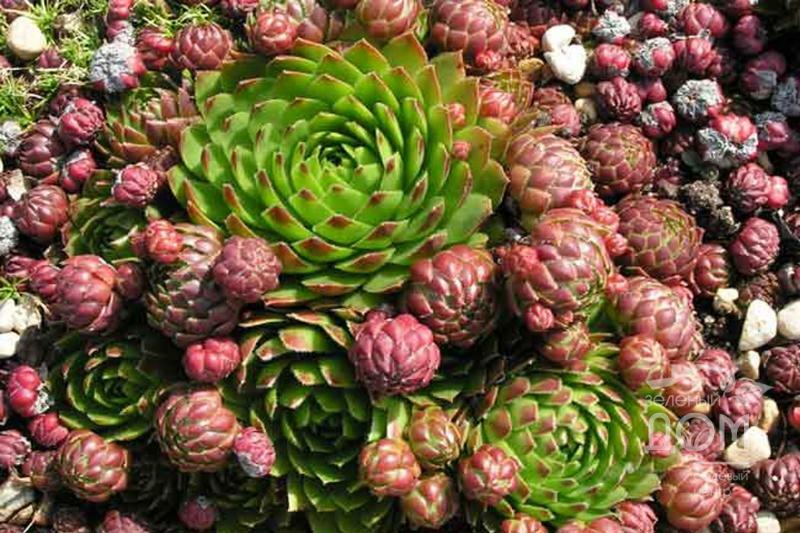 The selectors could not ignore such a pliable material, and brought up to the present time has more 4000 varieties of succulent. 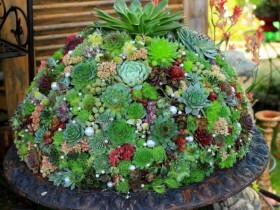 Topiary shape with the stone roses also possible, the plant is easily combined with herbs and flowers, for example, with stonecrop, the saxifrage, the thrift. 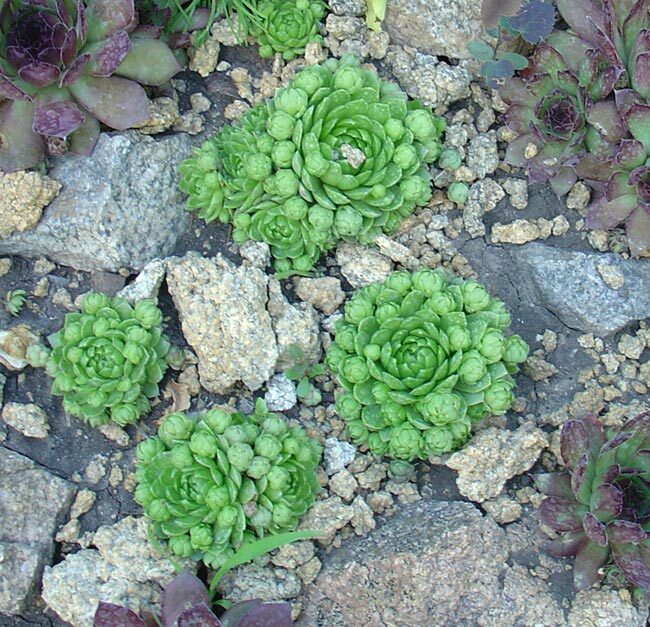 For fans of unusual: the young can be planted on a low roof flat, how did medieval Europeans. The root system of a small succulent, it grows near places, where other plants die: between the stones, in the gap between the tiles. Its amazing look will enliven the dull corners of the garden. The original form of the landing. Stone rose will allow you to "draw" the curve of the track in the Park, to create a "quilt" on a flat surface. You can even "draw" a picture. Breeders offer modern varieties of plants of almost any shade, which is found in nature: yellow and silver, pink and Burgundy, light- and dark green. In one landing, you can use the young of one species or several, they all look aesthetically pleasing and exotic. Will have to make some effort, but they are worth it. The young in the design of the track. To create this element of landscape design will need a certain area and fill, artificial or natural. And here is a small rocky garden can be done even in a small area. To begin, select a beautiful shrub, which will create a background composition, it can be a barberry. At the foot lay to the side of a large clay pot or vase, the soil can be partly covered with gravel or pebbles. 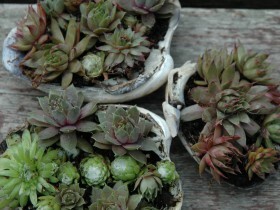 Fill the container inside and outside ground, plant succulent. Next you can place a few large stones. 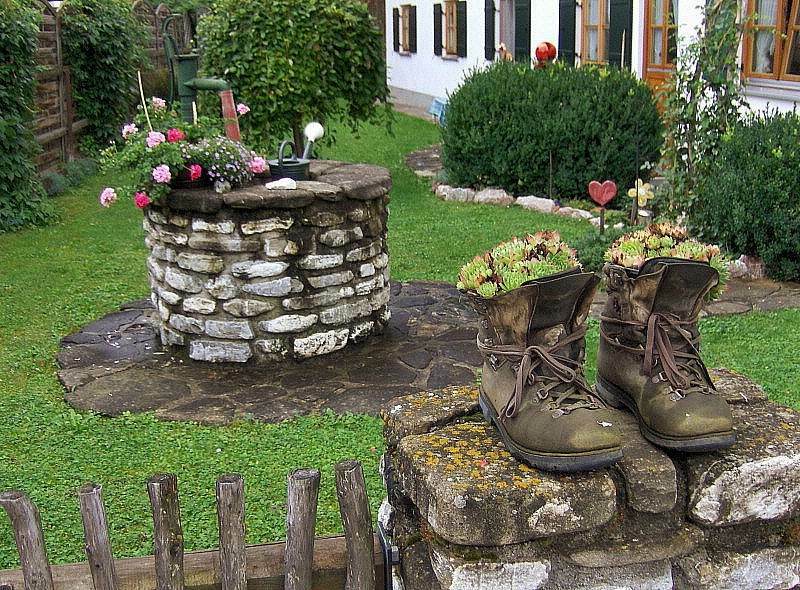 This mini-garden looks very picturesque, it can be done in any Sunny area of the site. The young leader of minimalism, quality decorative plants persist throughout the entire season. Composition on the background of large stones. To create an interesting composition in the Oriental style by using a few succulents in pots, adding stones and garden sculptures. A corner for relaxation will relieve stress after work, contribute to getting away from everyday life. Original versions of the landing: color pots, plastic coloured basin, box, old shoes, stone or concrete capacity. The only, but a necessary requirement for growing the stone roses in small containers to ensure the flow of excess moisture and promptly remove sprouts emerging, if there is no need in the growth composition. The main enemies of the stone roses – the magpies, jackdaws, jays and crows. 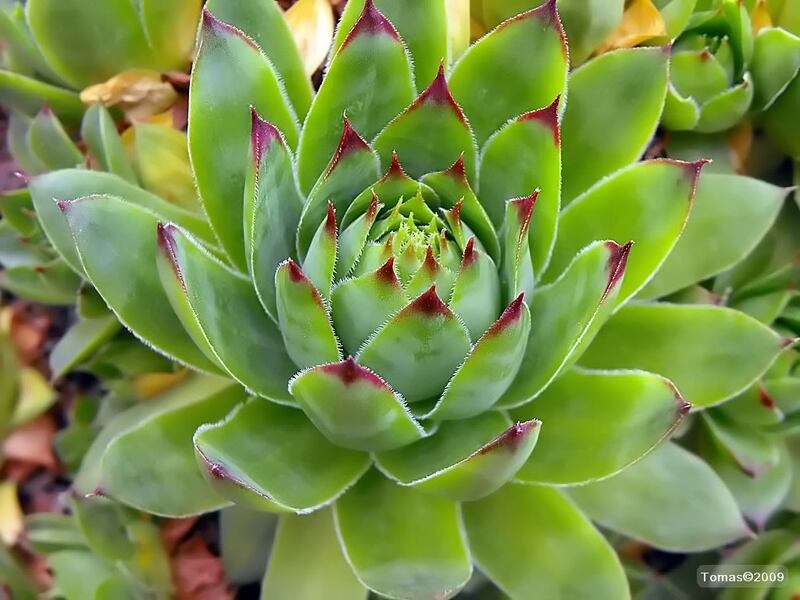 Birds can damage plants along with the may beetles: the larvae eat the succulent base of the stem. 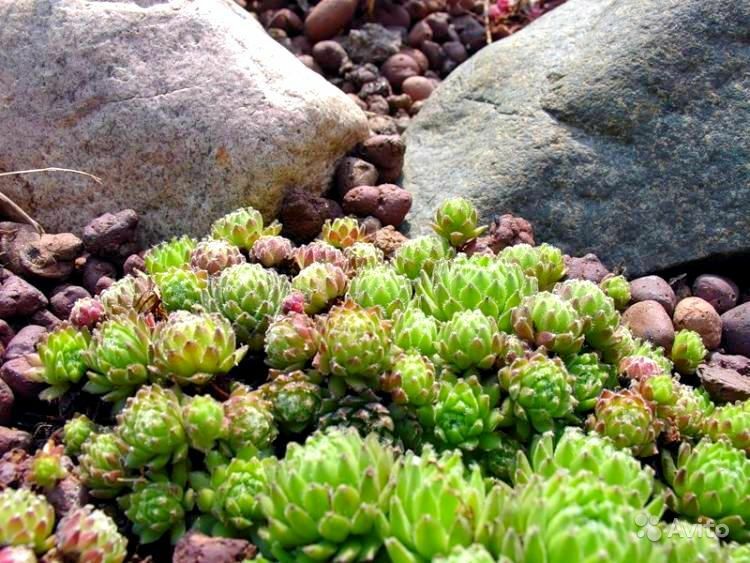 The succulents can take root again, but if the soil is too contaminated by the pest, then the young will have to be transplanted to a new location, and larvae from the ground to try to choose. Decaying plants also remove. The most important qualities of the young – the simplicity and the possibility of the gardener-fan to feel like a real artist / designer, able to turn a garden into a Paradise. Interesting composition will make every corner of the land of the living, original, attractive. 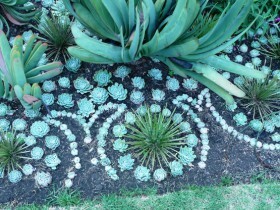 Original flower bed of succulents. Young in a stone bowl. Stone rose, planted in the sash shell. The pattern of small plants. All content on this site SamDizajner.ru written specifically for Simdesigner, copying 1 in 1 strictly prohibited. 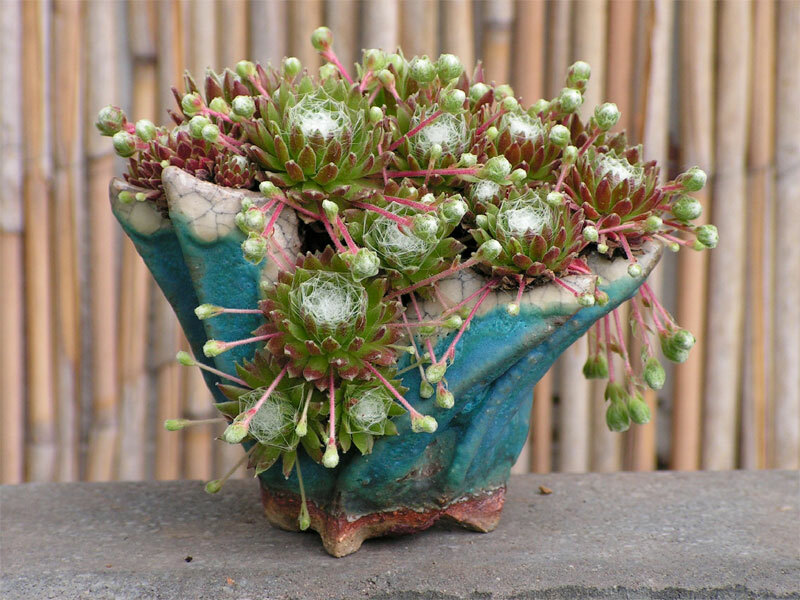 Reprint, full or partial rewriting of the article “Houseleek as a decorative element”, possible, only when you specify the full, active link to the source.